The year 2017 is nearing the end, and with that comes the end of hail season. Depending on your geographic location and how hearty your hail season was, you may be settling in for a bit of a rest to ride out the remainder of the year. As you wind down your 2017 season, now is the time to reflect on the past year, your business successes and challenges, and seek ways to perfect your business in the upcoming year. If you spent this year running yourself ragged between scheduling jobs, lining up new retail customers, invoicing and chasing payments, then you know full well how much that eats into the time available to actually complete the work that is paying the bills. There is no doubt that anything you can do to rid yourself of time spent handling office duties will increase your revenue now and into the future. It could also help you gain some peace of mind. You might want to consider stepping up to one of the PDR hail management apps offered on the market, including our very own ReconPro. These mobile device based applications are proven to free up wasted time spent on office tasks, as well as present a more focused and professional image for your business. If cost has been your biggest holdout, then we have some good news for you. Repair360 from Automobile Technologies is now offered 100% FREE of charge for a single user, and only $19/mo if you have multiple users on your team! Now you can take your back office with you on the job and complete necessary paperwork and documentation right from your smartphone or tablet, iOS or Android. What is Repair360 and what does it do? As mentioned before, Repair360 is a mobile app that gathers all of the necessary functions of your auto reconditioning business into one place. 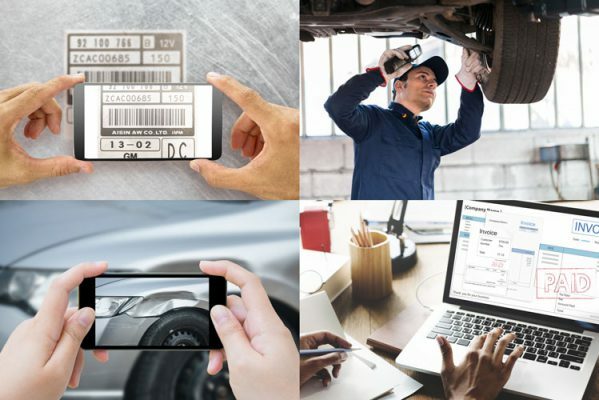 With Repair360, you can log in cars as you work on them, take pre-inspection notes and photos, create and email invoices and more, all from your preferred mobile device. – VIN Scanning and VIN decoding using your device’s camera. – Prior damage documentation utilizing your device’s camera to document prior damage and keep with the customer record. – Mobile Printing of invoices, work orders, and more directly from the app. – Mobile Email documents directly to customers or other technicians from within the app. – Full Customer Database of your customer records is kept and ready to access. – Historical Lookup allows you to access complete records for any customer. – Client Tracking for managing customers and revenue history to keep your business growing. – Repair360 works with or without the Internet to keep your business rolling and your customers happy. – Hail Matrix- a PDR industry staple, now you can access the Hail Matrix right from you’re your mobile device to provide guidelines for both proper repair techniques and associated costs. Repair360 offers several industry price matrices right out-of-the-box. Word of mouth and repeat business is won based on how professional your company appears and how easy it is to do business with you. As the business owner, it is your job to make that happen. Set yourself apart from the competition by offering the professional and paperless process that you can get with Repair360. No cost, no tricks and no gimmicks. AutoMobile Technologies, best known for their ReconPro app, is once again leading the PDR industry by offering its PDR software in a basic version totally free with Repair360. While Repair360 may not have all of the features as our subscription based ReconPro, Repair360 gives you all of the functionality that a one person or small PDR company would need to get to the next level in business. What are you waiting for? Download your copy today from the App Store or Play Store!